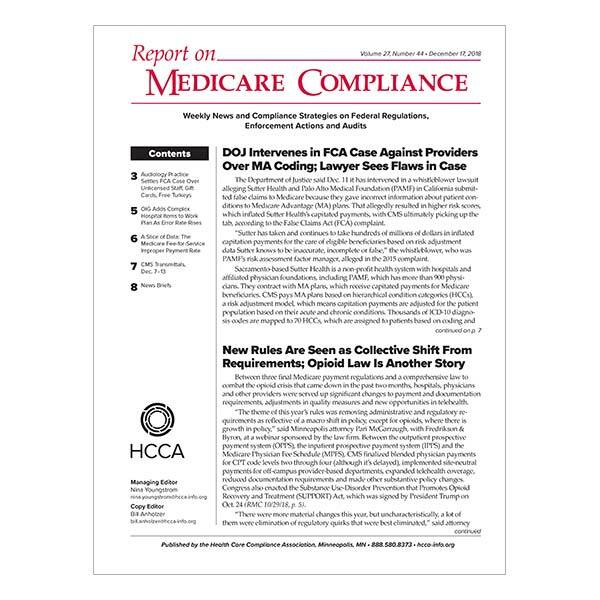 Report on Medicare Compliance (RMC) is the most timely and reliable source of news on medical necessity, inpatient and outpatient billing, Stark and anti-kickback compliance, documentation, claim denials and appeals, Medicare Advantage and more. When you subscribe, you will stay up to date on audits, regulations and enforcement in the fast-changing world of Medicare and get expert insights and guidance on what these developments mean for your organization. Access to a subscriber-only website with a searchable library of 25 years of past issues. A discounted subscription rate (if you are also an HCCA member). You will need to sign on again to view the current issue. Nina Youngstrom, editor of Report on Medicare Compliance, discusses her background as a journalist and her approach to writing the national newsletter. RMC is a weekly publication that provides valuable guidance on where Medicare auditors are going next, how the False Claims Act and Stark Law are being enforced, and what new regulations mean to your organization. Commentary from field experts brings topics to life and gives insight into compliance best practices.